Finally, the digitising project is finished! I have had about 1500 family photos digitised over the last year or so - several technical problems plagued the project, which is why it took so long. Not all of them relate to this blog but there are several photos that are important to the Čirkšis family history. One of the benefits of digitising photographs - and publishing a blog about them - is that you take a closer look at things. Many of the photos I have, have Latvian writing on the back of them. A lot of the writing is illegible, at least for a non-Latvian-speaker (I know I should learn!) but occasionally I can decipher enough to work out what the photo is of. This particular photo had been sitting in an album and I had never taken it out to examine it though, I had some idea that it must be the Pirtneiks (my grandmother's) side of the family. Today, while I was checking off the scanned photos to ensure they were all there, I glanced at the back and found some very clearly written Latvian! A quick google search and I discovered that my gut instinct was correct! This is indeed the Pirtnieks - though I still don't know their first names or their relationship to me. It appears that some of my family was deported to Siberia around 1950. The letter is signed but the signature is unreadable to me. Can you read the signature at the bottom? Do you know who these people are? If you have any clues, post a comment below! In the mean time, I have a few tricks up my sleeve that may help me identify my long lost relatives so stay tuned! "Sibirija 25/8 50 g. Par mazu atminu no pritnieku gimenes" From Google Translate this means something like "Siberia 25/8 50 g. For a small memory from pritnieku family"
I just googled Pēteris Pirtnieks and ended up on your blog. 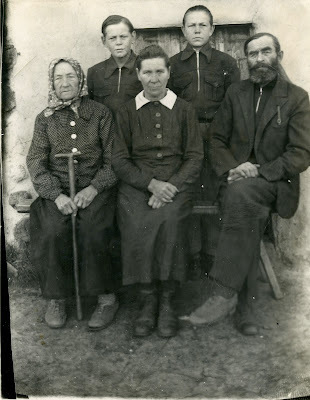 Of all deported Pirtnieks from Latvia http://www.itl.rtu.lv/LVA/dep1941/meklesana49.php?rinda=0 (found by entering Pirtnieks in the Vārds field), these people might be Pēteris, his wife Katrīna, sons Dainis and Jānis, and Pēteris' mother Maiga. http://www.lvva-raduraksti.lv/lv/menu/lv/2/ig/1/ie/87/book/4188.html (screen-shot 133, entry 61). My great-great-great grandpa was Pēteris Pirtnieks from Nīca, the same town as this family. This cannot be him as my great-great grandma is Pēteris Pirtnieks' daughter Ewe but this nice family doesn't seem to have a daughter born around 1950. The signature says Pirtnieks and there might be another P there for Peter.